Going & Don't Know If Tog Will Bite Again! (If they did always bite they'd more closely resemble the distinguished portly rotundity of a partyboat skipper..) Yes, my clients have caught 7 tog over 20 pounds ..but there were many other days when we paid dearly. Mate Danny DOES NOT have white crabs. Usually Does -- Bad Winter. The boat provides green crabs. Reservation staff hardly know what species we're after, let alone whether there will be a certain kind of bait. We Have No White Crabs -- None. Greens Only. Monday, January 22nd - 7 to 3 - $110.00 - 12 Sells Out..
Green Crabs (not Whites!) Provided As Boat Bait And Are Included In All Fares. Recent Blocks Provided By Potomac Valley Brick - Thank You! Support the Ocean City Reef Foundation! http://www.ocreefs.org (lots of reef pics here..) The OC Reef Foundation is a 501c3 non-profit with no payroll & no rented office space -- We Build Reef. Also registered w/Amazon Smile. We're Nowhere Near Reef Building's True Potential. Thank You! 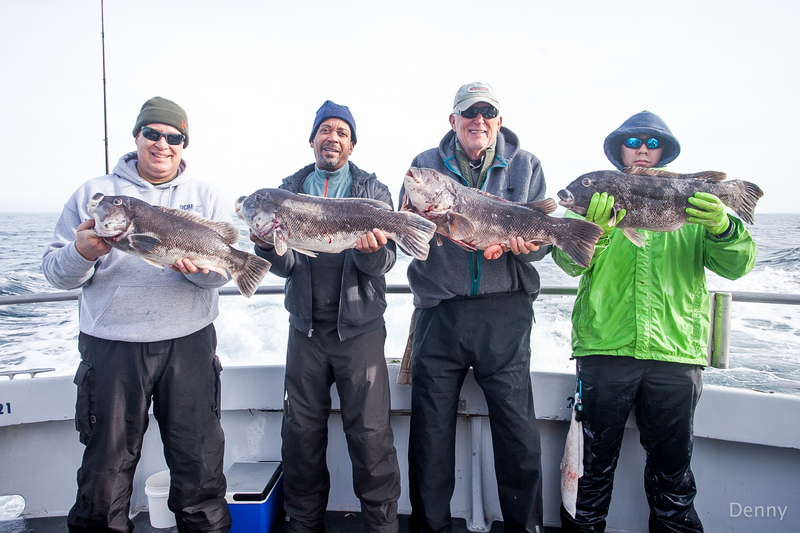 George, Mike, John, & Chol show off some dandies from our last tog trip January 11th..
Had a fine tog trip the 11th. Two fellows limited out. Most everyone had dinner+.. Ocean's getting mighty cold, mighty fast. Temps we might normally see in late Feb/early March are happening now. Tog have a threshold: we'll get to build a lot of reef if it gets too cold. Have 4 trips scheduled. Haven't had but 2 all of January so far. This is a brutal fishery ..in a brutal winter. For some, that makes it even more fun. Very early on, before regulation even, I began to urge managers to regulate black sea bass (BSB) regionally - to have distinct regional quotas. In fact, I foresaw commercial 'pulses' if we did not--that a region's population would swell and get harvested as multi-state winter trawl effort congregated near the canyons; that every year a different region's population would get whacked..
As with everything I've suggested, there was nothing but a whole lot of "Can't." "We Can't Sub-Divide The Hatteras To Cape Cod Region Into Smaller Spawning Regions." I mean really, why would temperate coral habitat matter to temperate reef fish; nor the fact that they winter far offshore yet rush inshore come spring to lay claim to the exact piece of reef spawning habitat they had the spring/summer before. Why on EARTH would habitat & how it's used matter to fishery management plans? Now, however, after squandering millions & millions & millions of dollars in unrealized BSB catch - both recreational & commercial - today's managers clearly see need of regionalization. Must be a PHENOMENAL amount of sea bass in that small slice of rocky bottom between Block Island & Cape Cod. I mean truly astounding. Today's SSB (SSB = Spawning Stock Biomass or simply Spawning Population) ..today's graph shows a population far greater than the highest population in my experience in the early 2000s. When we first had the 25 fish creel limit in 2002 - it was attainable. We often had clients catch 25 keeper sea bass. In 2003 my clients limited out more often than not. The whole boat would have 25 apiece.. So after the bag limit, fishing got a lot better, right? And, boy, is the reason complex. Far simpler than my 'age at maturity*' thesis, scientists are too glad to point to climate change as the culprit. A temperate reef fish that's doing just dandy in Georgia, northern Florida--even in the Gulf coast panhandle of Florida; yet fishery regulators hold black sea bass in the lower Mid-Atlantic have "moved north.."
In the last 15 years they've begun spawning in the Elizabethan Islands below Cape Cod - Martha's Vineyard & such. They're being caught from kayaks in Buzzards Bay (south of Cape Cod between the Vineyard & mainland) where, having tried to eradicate scup from those waters in my youth using clam, I'm certain I'd have seen sea bass in the early/mid 1970s had they been there. Lots & LOTS of rock up there. Granite. Buzzards Bay has warmed over 10 degrees in the last few decades--more like 12. This shallow bay catches southerly summer winds perfectly to warm. Sea bass are now using it for spawning habitat. BUT -- sea bass are available still in Georgia & Florida.. This is really important: where there has been habitat EXPANSION into the Cape Cod region -- there should NOT have been a habitat contraction in the lower Mid-Atlantic. If there is a contraction of sea bass habitat owing to warming, it is in lower/central Florida somewhere. What a terrible place to call "science." By law we have to regulate using "the best available scientific information." Sea bass (as partly proven by MRIP recreational catch estimates) have shifted north and left the southern end of the management unit. Sea bass habitat is of no consequence because the population shifts up and down anyway. Not if, but when MRIP shows one state's private boats catching as many fish in a few weeks as all Party/Charter across the 9 state management unit, that's science and don't you dare argue what are obviously lovely statistics. It MUST BE TRUE because it's on a computer screen. All real examples; and from this hopeless place of ill-considered rubbish being treated as sound, policy-forming, information -- today we finally have "regional" sea bass quotas being devised. .. exactly what was so blatant from those early ALS tag returns. If you'd like to make comment on these deliberations, here's the link. Just now there's an article from the Island Free Press showing sea bass will open in February.. Well, that's interesting. Let's see if it's true. It remains true that during those few years when we were limiting-out with 25 sea bass limits -- all of those legal fish 12 inch back then had been spawned when there was no bag limit & an 11 inch or less size limit. 2003 was the greatest population of sea bass I have ever witnessed. Now NOAA says there are several times that many today. Well, maybe, but not in this region. But by regionalizing we can begin to unravel habitat fidelity's crucial role in increasing populations. Sea bass are the easiest fish to restore. Roll rocks off a barge, force them to spawn young -- everyone will eat sea bass, including sharks & bluefish. Unfortunately, right now computers & MRIP catch estimates 'eat' more, by far, than the recreational fishery..